After my retirement I had to give up my summerhouse with a wonderful big workshop, also my house with a little workshop in the garden, and along with this most of my tools was left when I sold the summer house due to the fact I had a brake down, and simply did not have the energy to start sorting things out, so I choose to leave all behind to the new owners (he was a very happy man he said). Do I regret NO, it was a wonderful chance to start all over in life, also to stop buying cheap tools, and look for quality and history. 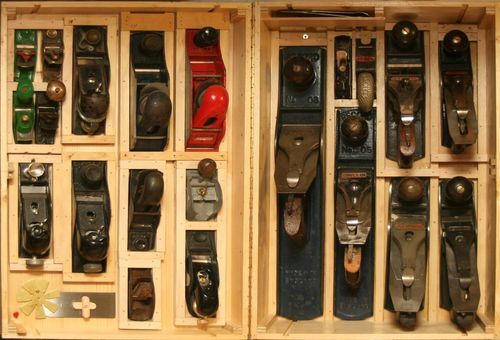 I do love old tools, and have during these last two years where I build up my little workshop, collected a good handfull of vintage tools from all over the world, mostely English and Japanese, handplanes are a soft spot – here some of them. 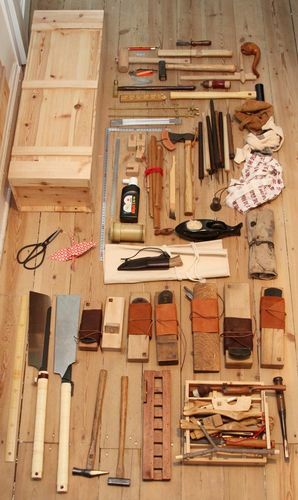 Also Japanese tools became a passion, this for the simplicity but also for the ways of using the body,to focus the energy and use the body as a part of the force and energy. Since my retirement I had a small basement workshop, but after I moved I had to find a new place. The place is a old shop in the center of Copenhagen in a lovely area full of life and cafe’s. So yes life is sweet here in the FACTORY. 1 Me in front of my little workshop I call the FACTORY. 2 This is the location, right in the center of Copenhagen. 3 Inside the shop room. 4 I do other than woodworking so it is also kind of a studio. 5 I made a place out of old windows, in the back room to take a nap, or stay the night. 6 Here a plan drawing of the place. Small shop but well equipped. I have extended my tool collection a bit, with a 300 mm circle sander, a festool circular saw with table. Right now I’m working on a routertable and a jigsaw table for this also. I also have a wonderful Hegner saw, and yes a good bunch of accu and hand tools. Yes and a lathe for metal, a welder and – there are so much I better stop. Mafe—I don’t think of my shop as small … just compact! I’m sure yours is the same … thanks for posting the photos. Sweet little shop and some great toys to play with…well done. Mafe, this is a nice looking shop that you have. It appears to be well organized, which is a must for those of us with smaller shops. And you have some nice tools in there. Great shop. I guess you make full use every inch available. Looking forward to seeing your project on knife making. I like your shop, Mafe. You seem to know how to maximize everything that you have. Great work. Love your shop Mads. My place is a mess compared to your place. Nice collection of planes. Not sure how you get them in or out. It looks like this was your wine box project. You have made a lot of nice things in this shop. Thanks for sharing your atelier. great setup you have there. Pb, My shop is so small I need to keep a strict order, and so small I have to go outside to even change my mind. Big smile. Thank you Ike, it keeps me happy, also on a rainy day. I definitely need to take lessons on workshop organization from you Mafe!!!! I think I need to take everything out of my workshop and start all over on organization. Thanks for a look at how it should be. Verna, I smile, and admit I like order. You little shop has a wonderful personality. It’s funny how much you can learn about someone by seeing what where they work and how there area has evolved around them.